Can I purchase Legacy Classic Kids Furniture directly from the factory? Can you provide pricing information? How can I find a specific collection or item? Does Legacy Classic Kids offer a warranty? How do I read the measurements given? Do you carry furniture for adults? How do I know Legacy Classic Kids furniture is safe? Does Legacy Classic Kids furniture include anti-tip hardware? What are the weight limits for beds and changing tables? What does "High/Low Rail positions" mean? Can I purchase just a Headboard? How can I get replacement parts for my Legacy Classic Kids furniture? Do all Legacy Classic Kids Cribs convert? How should I clean and care for my furniture? Where can I find instructions to assemble my furniture? How can I fix minor scratches? Can I purchase Furniture directly from Legacy Classic? No, sorry. As a wholesale manufacturer, Legacy Classic does not sell directly to consumers. Instead, we focus on what we do best (furniture design, production, and logistics) and partner with retailers who make furniture shopping, selection, delivery, and service easy and enjoyable. No, sorry. We do not influence the selling price retailers establish. Please contact a retailer for pricing. How can I find a specific collection? Please check with retailers in your area. Many retailers showcase many of our collections or can special order items. You can locate retailers in your area by using our Where to Buy feature. If you are having trouble finding a specific item or retailer in your area, please Contact Us at lckids@legacyclassic.com and we’ll be happy to help. Does Legacy Classic offer a warranty? Yes, Legacy Classic Furniture warrants its products to be free of manufacturing defects for a period of one year from the date of shipment from Legacy Classic to the retailer. After a period of one (1) year, Legacy Classic will replace any defective merchandise at a cost to the retailer, providing the merchandise is still available. Our retailers handle the service and warranty work for our products. Please contact your selling retailer should you have any problems with your products and for complete warranty information. How do I read the measurements? Yes! Some of our Legacy Classic Kids youth collections offer a queen size bed. Additionally, all Legacy Classic Furniture adult collections offer queen and king bed sizes. Please visit www.legacyclassic.com for information. What is a Slat Roll and do I need one for my bed? Slat Rolls replace a box spring to provide full mattress support in a compact size (less than 1” high). Slat Rolls come in both twin and full size. Please use this chart. What does “High/Low Rail positions” mean? 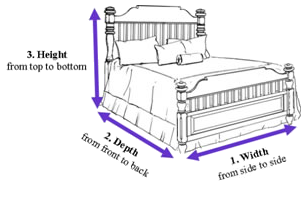 This means your bed offers a choice between two rail positions to lower or raise the height of your mattress. This feature is helpful if you have a young child, want to use underbed storage, or just like options! Many of our Headboards can be used with a metal bed frame in place of the Footboard and Rails. Although we do not supply bed frames, they are commonly available at furniture retailers and mattress stores. To determine if the bed you’re interested in has holes for a metal bed frame to be used as a Headboard only, please check the "More Info Tab". Your Legacy Classic Kids retailer can order replacement parts and provide service. If you have moved or need assistance locating a different retailer, please Contact Us at lckids@legacyclassic.com. Bunk Bed- Twin over Twin 37 1/2" - 38 1/2" 74" - 75" not more than 10"
Bunk Bed- Full over Full 52 1/2" - 53 1/2" 74" - 75" not more than 10"
Loft Bed 37 1/2" - 38 1/2" 74" - 75" not more than 10"
Baby Crib at least 27 1/4"
(69 centimeters) at least 51 5/8"
(131 centimeters) not more than 6"
Underbed Trundle/Drawer not more than 38" not more than 73" not more than 8"
Yes. All Legacy Classic Kids Cribs can convert to safely follow your child from infant to teen. An innovative design allows the crib to function as four different beds. With the addition of the Toddler Guard Rail Kit, the infant Crib (Stage 1) can convert to a Toddler Bed (Stage 2) and a Preschool Daybed (Stage 3). With the addition of Convertor Bed Rails, the infant Crib (Stage 1) can convert to a Full Size (or often called Double) Bed (Stage 4). Legacy Classic Kids furniture meets or exceeds all U.S. safety regulations including lead paint, lead content, and standards for Bunk Beds and Cribs as overseen by the CPSC (Consumer Product Safety Commission). Legacy Classic Kids Cribs also meet required Canadian Crib and Cradle regulations. Legacy Classic Kids Bunk Beds, Lofts, Baby Cribs, Changing Tables and Toddler Beds additionally meet or exceed ASTM voluntary safety guidelines. Legacy Classic Kids Dressers, Bureaus, Chests, Door Chests, Bookcases, and Desk Hutches include anti-tip restraint hardware and meet ASTM voluntary anti-tip guidelines. Additionally, Legacy Classic Kids is a member of the Juvenile Products Manufacturers Association (JPMA) and the American Home Furnishings Alliance (AHFA). All Legacy Classic Kids drawers have a positive drawer stop which prevents the drawers from falling out of the case when opened. Yes, anti-tip hardware is included with all furniture over 30”. This hardware kit allows the furniture to be anchored to the wall to help prevent accidental tipping from a child playing or climbing on a piece of furniture. Additionally, Legacy Classic Kids furniture meets the ASTM voluntary anti-tip standard which involves weighted tip tests and labeling requirements. Please do not discard these wall anchors. If you have young children, consider adding additional restraints (available at home improvement stores) to all your furniture and appliances to prevent a tragedy. Dust with a clean, damp cloth. Avoid placing your LC Kids furniture in direct sunlight or a damp area. Furniture should not be placed in front of or over heating or air conditioning. Wipe up spills promptly. If left, they can cause damage to the finish. Use a protective pad when using a writing utensil or placing anything hot on the surface. Use felt pads under accessories and avoid placing plastics (such as place mats, vinyl notebooks, etc) on your furniture. Ingredients in some plastics and plastic feet on lamps/clocks may react with the finish. Assembly instructions are located on the website with each item and are also included in furniture cartons. Minor scratches can be touched up with furniture markers. Mohawk Finishing Products offers touch up paints to match all Legacy Classic Kids finishes. To locate a retailer in your area, please visit their website www.mohawk-finishing.com directly. Your Legacy Classic Kids retailer can order replacements parts and provide service. If you have moved or need assistance locating a different retailer, please Contact Us at lckids@legacyclassic.com.